This entry was posted on April 11, 2013 by seekraz. 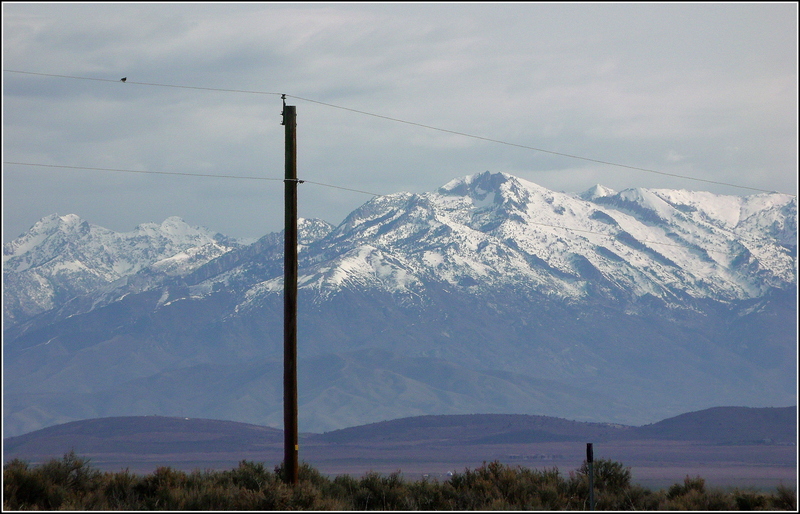 It was filed under Cedar Valley Utah, Photos - Outdoors and was tagged with bird on telephone pole wire, Cedar Valley Utah, mountain vista, photography, seekraz photography, snow covered mountains, telephone pole, Utah, Utah County, Utah photography, Wasatch Mountains. Beautiful. Such a stirring title. Here it was like someone flipped a switch. One day nothing and the next hundreds of birds singing. It was great! I wonder if it was a meadowlark? There’s lots of them out there. I really don’t know…was kind of far to tell and I don’t know their songs…but it was really sweet….. Thank you very much, Adrian. It rather felt that way out there….. So tiny against the mountins. So quiet the world would be if they stops singing. It would be very sadly quiet, Bente…. Beautiful words and photo! I’m sure she had a lot to sing about that view of hers! She sang partly because of the beauty of her surroundings. Those mountains inspire. I’m sure she did, Terry…and the mountains are very inspiring…..
“The quiet was sad without her” Gosh, I think that’s going to stick in my head. Beautiful, Scott.